Last fall, the university’s open access steering committee distributed a survey to faculty, researchers and teaching assistants on both campuses to gauge their interest in and understanding of open access (OA) scholarly communication and publishing. Survey results indicated that there is a wide range of both experience and views at The University of Toledo regarding OA. “I currently serve on 2 OA editorial boards …” –Professor, Main Campus. “The whole point of publication is to reach a wide audience.” -Professor, Health Science Campus. ““I have not had any experiences with OA, but I do believe in its purpose.” — Lecturer, Main Campus. “No personal experience, but peers do use this.” –Assistant Professor, Health Science Campus. “I don’t know anything about open access.” -Associate Professor, Main Campus. Both those who had previous experience with OA as an author, referee, or editor and those without such first-hand experience were in surprising agreement on most attitudes toward OA, except when it came to their preferred publishing model: traditional or OA. 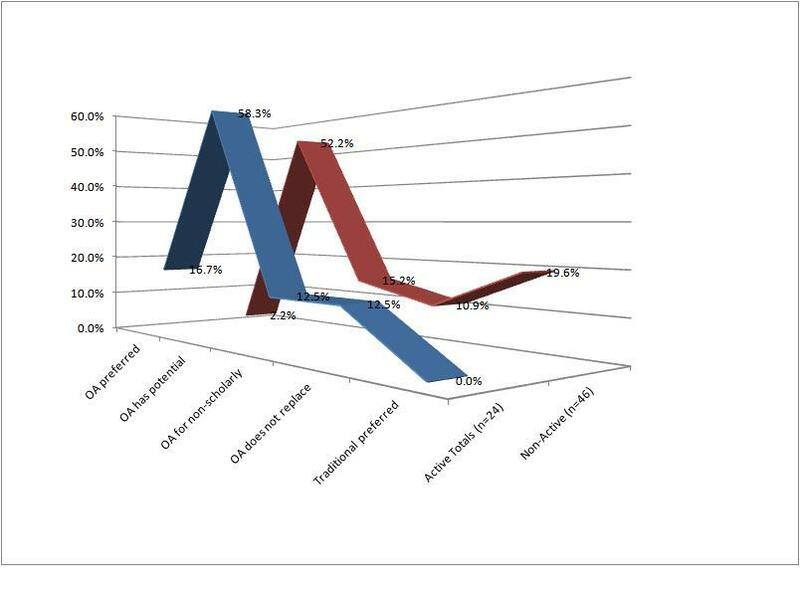 As shown in the graph below, active OA participants (in blue) largely agree with those aware of OA but who have not actively participated (in red). They seem to differ only in their agreement with the following statements: “OA is the preferred method of scholarly communication” and “Publishing in traditional subscription-based journals is the preferred method”. So, except for Non-Active preference for traditional publishing methods, proportionate rates of views about OA are very similar. Other elements of agreement are reflected in the statistics below. 70% are very concerned about the “formal recognition of their work as a scholarly product” (i.e., for promotion and tenure purposes) with 77% reporting that being published in a “peer-reviewed journal” is very important. 53% are very concerned about the permanence of their published work. 51% consider it very important to be published in the most highly ranked journal(s) in their field. and 46% reported a very critical concern over the protection of their intellectual property. These are all legitimate concerns that can be addressed by learning more about OA. One of the biggest misunderstandings that lingers is the notion that OA publishing means not peer-reviewed. For a list of helpful FAQs regarding OA, please see our LibGuide. “The problem for scholars needing tenure is that sometimes these journals are not respected.” –Professor, Main Campus. “I don’t like to have to pay to publish.” –Professor, Health Science Campus. “…all journal [publishing] should be open access if the research has been carried out with tax-payer money.” –Assistant Professor, Health Science Campus. Overall the campus survey revealed some clear demarcations. While more than one third (35%) of respondents reported having no experience with OA, nearly half (47%) reported having published articles in OA journals and a quarter (24%) indicated using OA publications in their research. One third of respondents reported knowing colleagues who have participated in OA and approximately one quarter of respondents indicated at least an awareness of OA. Furthermore, more than a quarter (28%) of respondents currently involved in research would consider publishing in OA journals. Some of the notable differences in responses correlated to the campus and academic rank of the respondents. The complete survey results set is available for viewing. This entry was posted in Uncategorized and tagged news, open access, surveys by Lucy. Bookmark the permalink.